First up on the main court tonight at Duffield was a welcome sight for all the home fans – the surprise return of Tania Bailey, first signed for Duffield in 2005, and a member of the PSL winning squads of 2006 and 2007. Facing Sarah Bowles, late replacement for Pontefract, Tania was 2/0 down when she found her length and racket skills, and raced through the points to lead 9/2, Sarah got another one before Tania finished off at 11/3. Although now retired from the professionals tournaments, Tania showed she still has all the skills she always had and, despite Sarah running all over the court and retrieving some great balls, Tania ran away with the second 11/0. Sarah started the third a little better, taking a 5/3 lead, Tania then went to 7/5, Sarah levelled at 7/7, but that was her last point as Tania took the game 11/7 and the match 3 – 0. 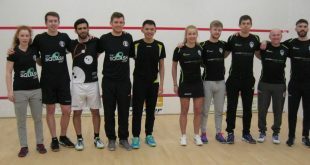 On the adjacent court the return of Aqeel Rehman to the Duffield squad proved far too much for young George Wileman from Pontefract, who had very few answers to Aqeel’s tremendous play, and Aqeel took a very firm 11/2, 11/2, 11/2 victory in very short time. 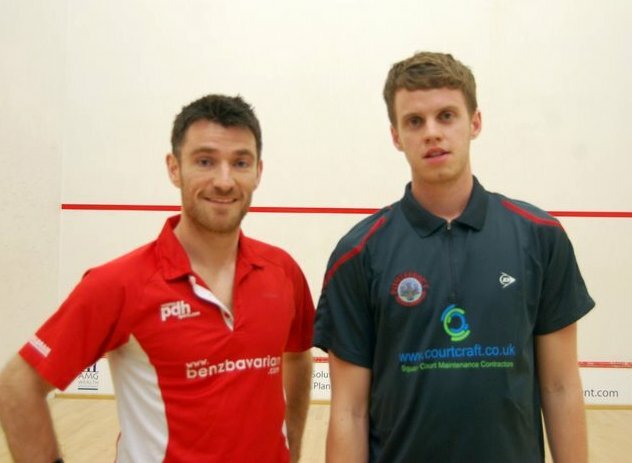 Following on on the same court older brother Sam Wileman from Pontefract played a much tighter game against Laurence Delasaux of Duffield, but could not stop Laurence from a 11/5, 11/7,11/4 win in only a couple of minutes longer. 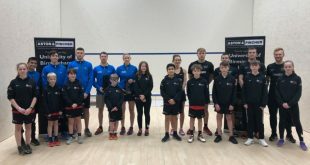 Back on the main court, it was the turn of Duffield’s favourite player Andy Whipp, fresh from a victory at weekend in the Wimbledon Cup, who faced Pontefract’s Neil Cordell. 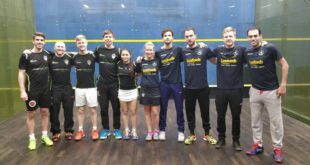 The first game proved to be the closest of the whole tie, with the hand changing several times to take the score to 9/9, but then Andy showed his experience to serve out for 11/9. In the second Andy moved quite superbly into a 7/1 lead, Neil pulled back to 5/7 but then Andy again served out to take the game 11/7, and again in the third proved much too strong for Neil and took the game 11/5 for another 3 – 0 win. Andy has played 7 of the 8 PSL ties this season, and has won every one! Last but certainly not least on the main court brought us Pontefract’s veteran Lee Beachill, former World No1 and still a great favourite with the fans, even here at Duffield, who was up against Jonathan Kemp for Duffield making what is a rare appearance this season due to a long term back injury. Jonathan moved into a 7/3 lead with some tremendous play, Lee pulled level at 7/7 with some of his old magic skills, but then Jonathan got back in to take the game 11/7. Again in the second Jonathan moved into a 7/3 lead and Lee pulled back to 6/7, but then Jonathan hit back again and allowed Lee only one more point before taking the game 11/7, at which stage Lee was showing great signs of tiredness. This showed even more in the third and, despite Lee putting up a really brave fight, Jonathan took the game 11/5 for another 3 – 0 win to Duffield. Already assured of the Group A winners spot before this match, a 20 points to nil victory gives them great confidence for the upcoming semi final on the 17th April. 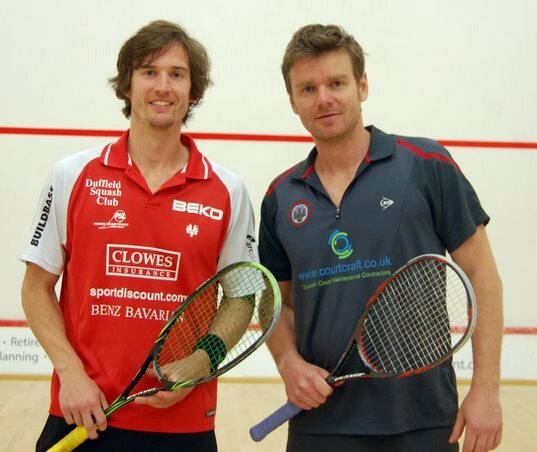 Benz Bavarian Duffield v Courtcraft Pontefract. Jonathan Kemp beat Lee Beachill 11/7, 11/7, 11/5. 26 mins. Andy Whipp beat Neil Cordell 11/9, 11/5, 11/5. 25 mins. Laurence Delasaux beat Sam Wileman 11/9, 11/7, 11/4. 20 mins. 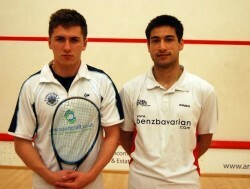 Aqeel Rehman beat George Wileman 11/2, 11/2, 11/2. 18 mins. 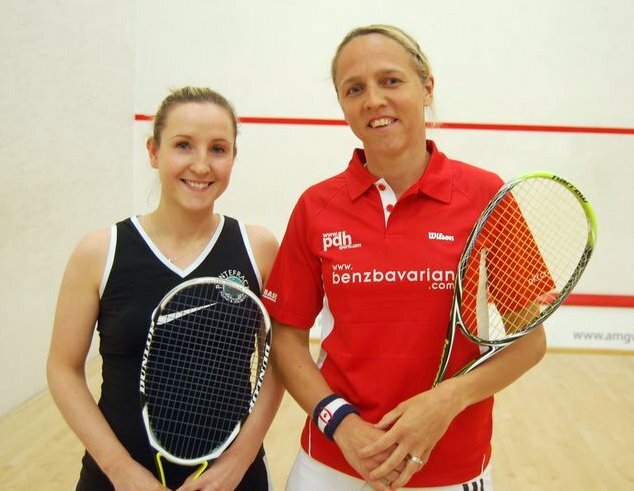 Tania Bailey beat Sarah Bowles 11/3, 11/0, 11/7. 18 mins. Greg Loach – won 9 out of 10 matches. Chris Alcock – won 5 out of 9 matches. Sam Watts – won 2 out of 7 matches. Andy Whipp – won 8 out of 8 matches. 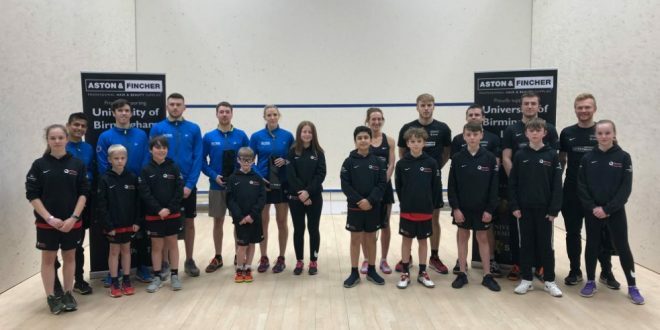 Sam Yallop – won 2 out of 3 matches. 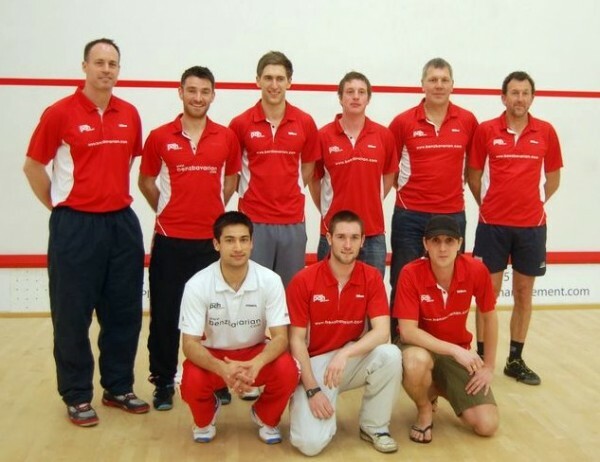 Aqeel Rehman – won 3 out of 3 matches. 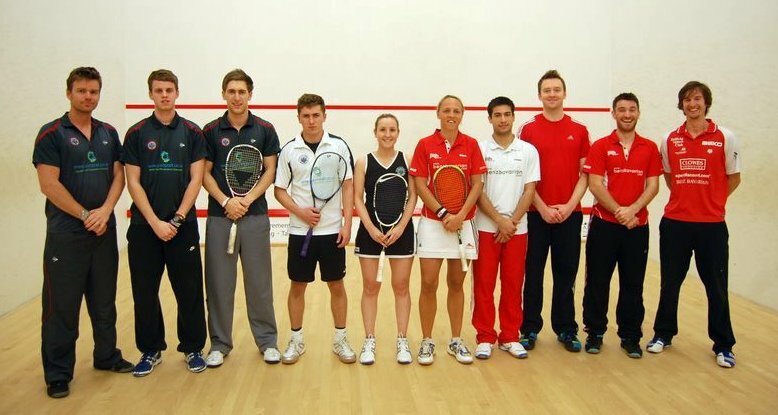 Sam Wileman – won 5 out of 5 matches. Jason Foster – won 11 out of 12 matches. Paul Hargrave – won 4 out of 4 matches. Mike Lambert, James Barry and Felix Frixou – all played one match each. 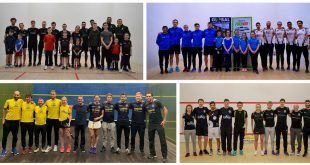 Many thanks to Duffield Squash Club committee and member for their support.